The number of reported cases of discrimination in English football increased last season, says Kick It Out and the Football Association. A total of 887 incidents were reported to the FA, while Kick It Out directly dealt with 393 complaints. Social media incidents involving participants of the game also went up. 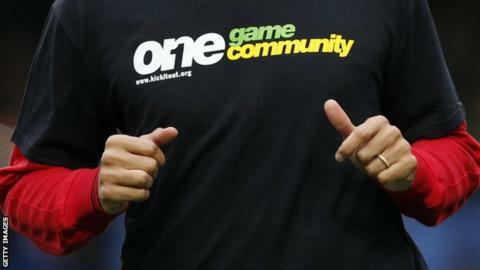 "It is widely acknowledged that more people are prepared to make reports about discrimination in football," said Kick It Out chairman Lord Ouseley. "This is due to an increased confidence in the regulatory system investigating complaints thoroughly with the aim of achieving effective outcomes." Ouseley said his organisation is particularly concerned with "increasing levels of hate crime in wider society" and "perceived worrying levels of prejudice" impacting on their work. He added: "We are urging all authorities and agencies to take action, particularly through education, to tackle this phenomenon in a concerted way, not only for the benefit of football but also for the whole of society in the UK." Among those charged in 2014-15 were Wigan owner Dave Whelan for remarks he made about Jewish people, defender Robert Huth for comments he made on social media related to gender reassignment, and striker Mario Balotelli for retweeting an image which appeared to contain anti-Semitic and racist references. Reports are recorded from a wide range of sources, including phone calls and emails into any one of the 52 County Football Associations across the country or directly to the FA at Wembley. Kick It Out allows complainants to report incidents through its website, telephone hotline, email and social media, while 36% of people used the mobile phone app to report incidents.